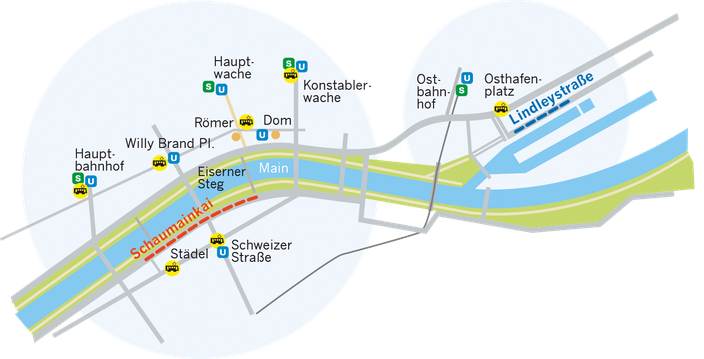 Every Saturday (except Holidays) between 09:00 and 14:00 Hrs takes place “Frankfurt’s Flohmarkt”. In the Flohmarkt, the visitor’s can buy second hand goods in good condition that includes a vast variety ranging from kids toys to nice art pieces and sometimes even valuable antiques. Thanks to the beautiful locations of the flohmarkts, while the visitors are shopping, they can either enjoy the majestic “Frankfurter Skyline” or get acquainted to the charm of “ Frankfurt Osthafen”. In Parkhaus Lindleystrasse 13, the visitors can park free of cost. Starting 01.06.2017, selling bicycles in the Flohmarkt are not allowed.